Marx referred specifically to Louis Napoleon's coup d'etat in 1851, which came nearly 52 years after his uncle, Napoleon Bonaparte, seized power in France in similar fashion. He might as well have been commenting on cloud computing, though. The reaction of many in IT to cloud computing is eerily similar to initial responses by similarly placed people in regard to open-source software. 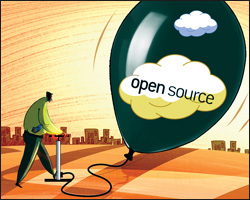 One can view this latest set of reactions as a farcical repeat after the initial open-source struggle-and one can predict a repeat of the outcome, as cloud computing is undoubtedly going to emerge successful, just as open source did. Cloud computing is coming and businesses need to be ready. The transition to public or private clouds is gaining pace as companies realize the potential for transforming business capabilities and driving new innovative services. In fact, while cloud services are still in a nascent stage, IDC estimates that the market was already USD16 billion worldwide in 2009 and is expected to reach USD55 billion by 2014. To put this in context, cloud-related IT spending was only 4 percent of the total IT market in 2009, but is expected to increase to 12 percent of the total IT market by 2014. Among the benefits of cloud computing are lower infrastructure costs, reduced time to market and greater flexibility, with no need for enterprises to buy, install and maintain IT infrastructure and software. It can allow companies to become more agile and entrepreneurial, while the cloud computing vendor can deliver economies of scale by amortising its costs over all its customers. And we all also know that cloud is catching on in a big way. According to Microsoft, 70 per cent of businesses say they have already moved to the cloud or plan to do so. Regulatory pressures and business requirements demand that both buy-side and sell-side firms generate faster, more frequent and accurate pricing and risk analysis. At the same time, most firms need to assess trading and risk management decisions from a consistent, enterprise-wide, cross-asset perspective. But calculating such complex risk and pricing typically requires an enormous amount of computing power; resources that many firms, particularly hedge funds, asset managers and insurance companies do not have. Many enterprises are struggling both with deciding which applications should be moved to the cloud and which combination of vendors to use. In the fourth article in the Open Cloud Visionaries series, we interviewed Sadagopan (Sada) Singam, Global Vice President, Cloud Computing, at HCL Technologies Ltd., a pre-eminent technology services company in India. Singam offers battle tested advice for CIOs and CTOs who are trying to map out a coherent cloud migration strategy.